In city after city around the world, no matter the geography or climate, once a real bike lane network is in place, people come up with all kinds of wonderful reasons to ride a bike - after all, cycling is a practical, healthy, invigorating and above all fun way to get around a city. But when a city actually invests in cycling infrastructure and cycling goes up, the underlying reason - the reason that makes all the other reasons possible - is that it becomes possible to choose to ride a bike. Before cycling can elevate a city, you need bike lanes to elevate cycling. It's that simple. I have rode a bike for most of my youth (particularly before I had a driver's licence) and I never needed bike lanes to do it. I don't disagree, I'm sure you did bike frequently without bike lanes. So did I.
I think the question is, would you be more likely to bike now, at your present age and circumstances, if there were bike lanes? At present, the majority of people seem to ride their bike either for recreation/athletics, or when "forced" (e.g. young Capitalist in their pre-driver's licence years). If infrastructure was in place that made bike riding more pleasant and safer, would you choose to ride your bike more often? Would it make any difference at all? Maybe for you the answer is no, but evidence from cities around the world suggests there are a number of people who will chose to bike - at least some of the time - if given safe, convenient and "fun" routes. Yup. Personally, I go racing traffic often myself - I have no problem pulling my bike into the blender. But when I haul my kids in the Chariot trailer? No, I stick to side-roads and bike-lanes for that, no exceptions. More bike lanes means I can take my kids more places by bike. I experienced this during March Break, when I rode with my nine-year-old down to Bayfront Park to enjoy the nice weather. Unless you're coming from Westdale, in which you can pick up the Waterfront Trail at Princess Point, you're stuck riding Bay Street North to get to the waterfront - and there aren't any bike lanes. The ride was mostly uneventful (we had one 'helpful' passenger in an SUV yell at us to get off the road) but unpleasant. The ride back was even worse, since the configuration of one-way streets means there's no easy way to ride home without going on the transport truck-clogged Queen Street. We ended up dismounting and walking a couple of blocks until we could take Peter Street over to Pearl. Yeah, and Queen is a major artery connecting Cannon to King, so the city will never do anything to rehabilitate it, and if the city ever gets off their duffs and does something with the West Harbour, I'm sure they'll do everything they can to make Bay even worse. Maybe Caroline could be identified as a bike route? Get a path across Sir John A and get rid of the one-way? To answer your question, now that I have my driver's licence and am more aware of a driver's driving habits I would not ride my bike on the road with or without bike lanes, it is just too dangerous. I keep bike riding to paths and parks. Well, there you have it then, you are exactly the kind of person the City wants to get cycling. Imagine if you could cycle to your parks and paths, rather than having to drive there. If bike lanes won't make you feel safe enough we'll have to figure out what will make you feel safe enough to bike and implment that feature instead (walled off bike lanes?). I don't think anything wil make me feel safe enough. A bike coming in contact with a 2 tonne car is no contest. Here's where the going gets difficult. Approximately 30-40% of the population are in the "no way, no how group". Whatever accomodation is provided, they don't see a use for it, and will not use it. No matter how "cool" cycling is, people like Capitalist cannot see themselves reflected in the discussion. This is the proportion that has absolutely no desire to cycle, yet this is also the group that reaps the greatest benefit when others choose to cycle (from less car traffic for them to contend with on the remaining road space). Their concerns largely are around the issue of sharing the space with other types of user. The prevailing view is that streets "are for cars". The concept of "sharing" that space is almost alien. Until that mentality changes, progress on cycling and pedestrian initiatives is unlikely to meet our needs. What about a wall like the one halfway down the Jolley Cut separating the sidewalk from traffic? Would a wall like that make you feel safe? the evidence in Hamilton also suggests safer lanes and routes are needed. I applaud those of you who are confident enough to cycle around our high speed downtown streets. I tried a few years ago and just couldn't do it. I can cycle with some alternate, side-streets routes, but I'll never do Main again. On the other hand, I tried York Blvd ONCE before it had bike lanes and I ended up picking up my bike and putting it on the off-road trail out of sheer fear. Now with the lanes on York, I regularly use them over to the stairs down to the waterfront. Personally I have no use one way or the other for bike lanes. I stay off the main streets no matter whether they are there or not. A white line gives me no comfort whatever if thats what a bike lane means. Just as the white line does not provide any comfort or safety for cyclists. It also does not prevent cyclists from suddenly jumping OUT OF the bike lanes to make a turn, take a short cut, change direction etc etc. I've witnessed it countless times both here in Hamilton driving my truck and cycling, and also in Toronto at work riding around in a Fire Truck. I'm not opposed to bike lanes. I'm opposed to bike lanes in places where they make no sense and will only lead to tragedy. Building bike infrastructure is fine. But unless it coincides with an education and enforcement policy that treats cyclists and automobile drivers as equals and equally responsible for what happens on the streets it won't reduce accidents in my opinion. Cycling advocates cannot look through rose coloured glasses and point to automobile drivers as the cause of all car/bike carnage on the streets. It just ain't the truth. On one hand, I'd love to throw away my car and never look back. But, it's something that I need since I have such a long commute to work. I also would need one for things like grocery shopping or visiting relatives who don't live in town. Even getting from my place to relatives is about 20 minutes by car; to do that on a bike would probably be about an hour. On top of that I'd be sweaty and need to shower before being presentable... leading to bringing an alternate set of clothes. In my youth we used to bike anywhere and everywhere around town, mostly due to the rail trail and calmer streets in the 'burbs. Now, I'd do it more in a setting like the rail trail or the bayfront, but it's impractical to juggle $50-100 of groceries on the handlebars of a bike. but it's impractical to juggle $50-100 of groceries on the handlebars of a bike. Indeed it is. That's why bikes traditionally had rear racks and front baskets or rear pannier bags. Look around and you'll see that many bikes do have these things again. I'd already noticed that. However, it doesn't make me want to run out and buy a bike with saddle bags, etc. I can't think of putting that kind of stuff into a basket or saddle bag. It'd be heavy, throw off the balance of the bike or get crushed in transit. As has been said, I'll keep my biking to trails and less-used roads than main arteries in our fair City. EDIT: not to mention that most bikes do not come with those accessories, thus adding an additional cost. Just because YOU give up so easily that you aren't even willing to try does not mean that everyone else who tried and succeeded should suffer because you don't think bike infrastructure matters. Yeah, I'll get right on biking from my home downtown to Mississauga. The 2-day trek sounds inviting! And yeah, $20 may not be a lot to you, but it is to me. The chariot has the additional benefits of increasing stability, and causing cars to give me a wider berth. I've been known to take an empty chariot downtown for this reason alone. A new chariot isn't cheap, but used ones can be found easily at relatively low cost. Even without kiddies, I've considered a used kiddie trailer for cargo - they do seem pretty versatile. ... and which I think that I can co-opt for some other uses. I've already determined that it will take 20 lb tank of propane, for example. Well, to be blunt - you're just wrong. 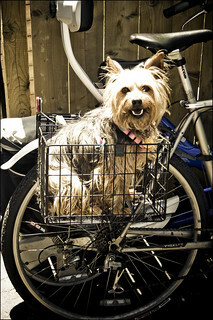 I carried more than that with negligible effort and cost in the $12 folding wire rear baskets on my hybrid - each basket fit two black, fabric PC shopping bags - or the world's largest yorkie) with room to spare. I could carry just as much in the $30 vinyl panniers I used to have on my city bike. 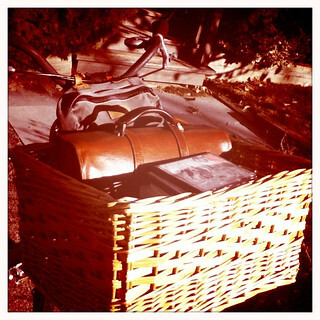 And with the old picnic basket on my front rack? Your shopping list isn't remotely a challenge. You have your opinion; I have mine. I can't guess as to the weight of your things, but a small dog and a few boxes (full or not? can't tell) don't do justice to lugging 30-40 pounds on a bike for a 15-20 minute ride. I routinely cycle with hundreds of pounds loaded on the back of my bike. No one is saying that *you* have to do it, but it is possible - and easy - so it would be polite for you to stop telling other people that they can't. Sigh. Those pictures were just to show the containers. It's interesting and perhaps instructive that the period in which cycling-as-transportation was most discouraged in North America coincided with the dominance of the most impractical bicycle design: the mountain bike, which is great for recreational cycling on off-road trails but not so useful as a vehicle. As North American cities (at least some of them) begin to embrace cycling as a cleaner, healthier, more affordable and more sustainable transport option, we are seeing a shift in emphasis from mountain bikes back to more European-style commuter/utility bikes: more comfortable seating and ergonomics, baskets and panniers, pant cuff protection, and so on. Another data point: as cycling infrastructure improves and cycling becomes more normalized, the gender distribution of cyclists shifts from overwhelmingly male toward a 50:50 split. When there are no bike lanes and cycling is regarded as a "road warrior" activity, it is mostly just young men who voluntarily assume the risk of cycling in mixed traffic. It's important to note that the bikes, as sold in stores, aren't even road worthy in this province. Without lights and bells and reflective forks/seatstays they aren't street legal to ride in Ontario, especially at night. And yet nobody would ever pretend that a cheaply made $200 Canadian Tire bike was a piece of sporting equipment. This is absurd. Imagine going to a car dealership and finding out nothing on the lot was actually ready to drive on municipal streets. Why can't you have a bike and a car? Bikes are inexpensive, and you could use your bike to get around town or for fun, while saving your car (and money) for groceries and out-of-town excursions. I don't think anyone is suggesting anyone get rid of their car and replace it with a bike, rather I think the point is that one could use their car less (therefor saving money while helping the environment and your health) if only a viable Network of bike lanes were available in Hamilton. Seriously, biking is impractical as a transportation method for anything but leisure. Sweating during the summer means reeking at work/wherever you are going, which is not an option and winter conditions make it impractical as at best you are going to get messy, very quick on your bike or at worse be unable to traverse at all given the conditions. You can't carry a large load on a bike, and you certainly have a much higher capacity to damage what you do transport while riding one. I would much rather the city focus on intensification and pedestrian initiatives, and leave cycling improvements to trail expansion and creating more larger parks for cycling to take place. Then and only then, if there is a massive, proven cycling culture in the city, consider expanding the existing bike lane system. I'm amused to learn that I don't exist. I guess that depends on your definition of leisure...and the distance you're travelling. At moderate distances biking is practical withouthaving to shower or get messy - particularly in the warmer months. Similarly, if you're making a small grocery run (some fresh bread from a local bakery, or some essentials from the convenience store) I think a bike might be just as feasible as a vehicle. I agree that it's difficult if not impossible to live completely without a vehicle in Hamilton, but we dont' need people biking everywhere, we just want to give people the choice to bike somewhere. Your line of post hoc reasoning about why more people don't ride bikes in Hamilton is exactly what I'm talking about in this blog entry. If cycling is impractical, why do rates of cycling consistently go up when cities invest in cycling infrastructure? I commuted year-round by bike for several years (more recently I walk to work) and it was as practical as it was enjoyable. Sidenote: this is not about automobiles vs. X (where X is anything other than an automobile); it's about having a variety of choices in how to get around and being able to choose the best option for a given trip. "If cycling is impractical, why do rates of cycling consistently go up when cities invest in cycling infrastructure?" Ryan, if this is true (which I question) then by how much does it go up and is the investment worth the cost? Hammer made a very good post about why people don't cycle, it is just not practical and any amount of spending is not going to change this. I and other writers have cited a large number of case studies on this site over the past several years. If you have counter-examples, please share them. then by how much does it go up and is the investment worth the cost? Hamilton could build out an entire city-wide bike network for about what it spends in a single year on its roads budget. Less wear and tear on the roads: a cyclist weights around 90 kg, whereas a car weighs 1,400-3,500 kg. Lower public health costs since regular cycling adds a net average of several years to life expectancy. Lower vehicle emissions and cleaner air leads to reduced incidence of heart disease, asthma and emphysema and fewer hospital admissions. Reduced cyclist injuries and deaths in collisions with motor vehicles. This seems counter-intuitive, but as the number of cyclists goes up, the number of injuries and deaths goes down. Reduced injuries and deaths for motorists as well (see "Evidence on Why Bike-Friendly Cities Are Safer for All Road Users" by Wesley E. Marshall and Norman W. Garrick). The evidence abundantly contradicts this thesis. Repeating it doesn't make it true. And all of the accompanying citations would indicate that there appears to be ample evidence on both sides of the equation, for and against bike lanes. Here are choice quotes/rebuttals to your points. Less wear and tear - In 2007 the city of Copenhagen spent DKK 9.9 million (US$1.72 million, €1.33 million) annually on maintaining its cycle track network. While this is not really showing reasons against wear and tear, it is an additional cost. Also see Lower vehicle emissions. Lower public health costs - This I won't dispute. There is no question cycling offers tangible health benefits, which is why I am for upgrading existing leisure exclusive cycling infrastructure (trails, parks, etc) and pedestrian infrastructure as walking also provides tangible health benefits. Lower vehicle emissions - In the UK, a ten-year study of the effect of cycle facilities in eight towns and cities found no evidence that they had resulted in any diversion from other transport modes. Safety - Studies that also found negative safety aspects of cycle tracks also come from Linderholm, Sweden, and from Jensen et al., Denmark In the United Kingdom, the UK Cycle Campaign Network made a 2007 statement that they know "of no evidence that cycle facilities and in particular cycle lanes, generally lead to safer conditions for cycling". There are studies that promote and favor both sides of this issue. So this is when the question becomes is this a worthwhile investment? I would say at this time, no. Why? Well here's another choice quote. In relation to the UK, it has been argued that locally high levels of cycling are more likely to result from factors other than cycle facilities. These include an existing cycling culture and historically high levels of cycle use, compact urban forms, lack of hills and lack of barriers such as high speed intersections. Meaning, it becomes worthwhile when a massive urban overhaul is done and existing culture is present. The former is accomplished better by pedestrian initiatives and intensification, the later is brought about by leisure based cycling initiatives. A point though I want to stress, which I did not bring forward earlier, is our city is dealing with a limited budget right now. The Pan-Am games and soul crushing infrastructure costs that our city faces means that we need to start being cautious with our investments, and bike lanes aren't a cautious investment to me a this point, given evidence on both sides. Nor do they appear to be a practical fiscal investment, when compared to other urban intensification initiatives. And all of the accompanying citations would indicate that there appears to be ample evidence on both sides of the equation, for and against bike lanes. So I went through and read your Wikipedia page. On balance, the evidence seems pretty heavily weighted in favour of cycling facilities, especially cycle tracks as opposed to painted bike lanes. The studies finding little or no benefit to cycling tend to be small, limited in scope, old or missing altogether; whereas the studies finding significant benefit tend to be larger and more comprehensive. Regardless of other debatable factors, cycling facilities improve overall safety by encouraging more people to ride bikes. It seems pretty clear that the net safety impact of increasing the number and concentration of cyclists outweighs any negative artifacts of cycling infrastructure (e.g. the situation in which a motorist is turning right from a driving lane to the left of a bike lane). This is particularly true when cycling infrastructure is built to a high standard as in places like Copenhagen and Amsterdam: wide lanes, grade-separated from motorists, priority at intersections, etc. Bicycle trips in Copenhagen have been increasing steadily since the 1970s (while cycling casualties have fallen steadily) and now account for 35-40% of trips. I wasn't able to find a city budget for roads maintenance to compare with the budget for bike track maintenance, so I can't compare the relative costs (e.g. per trip or per person-distance) of each mode. However, a budget of $1.72 million to maintain routes that enable almost half a billion annual kilometres cycled (1.3 million km per day) seems like a pretty good bargain. This shouldn't be a surprise: basic physics tells us a 2,000 kg automobile is going to cause more than an order of magnitude more wear and tear than a 90 kg bicycle. Moylek already provided a cogent answer to this, and I can certainly concur from my own anecdotal experience. I would be hard-pressed to fit an exercise regimen into my leisure time, but I walk six kilometres a day in my daily commute to and from work. Unfortunately there's no link to the study and I can't find it online to evaluate its thesis and evidence. However, the listed title in Wikipedia is "Cycle Routes, Traffic Advisory Leaflet 5/95, UK Department for Transport, 1995", which doesn't sound very comprehensive. I haven't been able to track down the original study that draws this conclusion. It is no longer posted at the link provided in the Wikipedia article, and Google searches for the URL and the quote mostly just return links to the Wikipedia article and to other similar for/against summaries that merely reproduce the exact same quote, which suggests they also sourced it from the Wikipedia article. So far, I'm not having much luck finding, let alone evaluating, the supposed arguments against bike lanes. That's a bizarre argument. The UK does not have high levels of cycling (except in small pockets in a couple of university towns like Cambridge) or an existing cycling culture, so it's hard to understand how such a conclusion could be drawn from the UK data, except by using the same post hoc reasoning that I argued against in this blog post. On the other hand, a number of cities that did not have high levels of cycling 10, 20, 30 and 40 years ago have been successfully increasing their rates of cycling: Montreal, Portland, New York, Paris - even Amsterdam and Copenhagen, which followed the same automobile-promoting policies as other cities in the 1950s and '60s and had very low levels of cycling in the 1970s. There is no question cycling offers tangible health benefits, which is why I am for upgrading existing leisure exclusive cycling infrastructure (trails, parks, etc) and pedestrian infrastructure as walking also provides tangible health benefits. People who walk or cycle for fun might cycle - what? - an hour or so a week? People who cycle or walk to work, to school, to the store, to the pub will spend much more time doing so, I dare say. Cycling in parks is just not the same thing at all as cycling as part of everyday life. I have a hard time believing that you are in earnest when you suggest paths in parks in place of bike lanes on roads. I would argue that walking for fun is usually a daily activity (especially if you own a dog) and generally when I've gone cycling, I'll agree, about an hour a week with maybe an occasional quarter day trip. I would say, the distance involved in making any kind of cycling trek part of everyday life would lean me towards being much more negligible. As in most cases, that kind of distance is usually accomplished within walking distance (at least within a good Urban environment). but, as I stated, one of the reasons I would support this form of expansion is precisely because it aids in creating the culture needed to really push and make bike lanes viable. After all, who doesn't like cycling at Pier 4? Even more so when you can create large multi-use parks (like Gage Park and Bayfront Park) and thus leverage it as both cycling infrastructure, greenspace (and hopeful brownfield reclamation) and event space. Some place like say, redeveloping Confederation park, or a West Harbor expansion of Bayfront linking up to Central Park or the area around Dundurn Castle. Money better spent then road conversion in my eyes. After all, who doesn't like cycling at Pier 4? Is -Hammer- not reading anyone else's text or is he being deliberately obtuse? Or is this mere trollery? I'll give him the benefit of the doubt. Sure, I love biking at Pier 4. But it hardly takes me to work or the store or a cafe or a bar or the other places I regularly bike to. One might as well offer up Cayuga Speedway to someone who is asking for more highway lanes for driving to work. Ryan, you are forgetting another geographic fact that makes cycling not very effective in Hamilton - the mountain. It sure is fun to ride your bike down the mountain, but going up? No thanks. I can never understand those cycling commandoes that bike up the mountain. I just put my bike on the racks that the HSR has mounted on all their buses and ride up the escarpment in comfort. Then when I'm close to my destination, I can get off and pedal the rest of the way. Yay! I can bus and bike, and doubly annoy the people who believe there is no viable form of transportation other than the divine automobile. There are always lots of excuses why it won't work here. Seriously, biking is impractical as a transportation method for anything but leisure. It is? Aww, man ... now I'll have to stop biking to work every day. And I guess I should have taken the truck downtown yesterday evening for that meeting instead of my bike. Crap. Well, thanks for clarifying that for me. Also, your car culture analogy is poor, because as you have stated MANY times before, more then just cars use paved streets. Every paved street in Hamilton is technically also a piece of cycling infrastructure. It's just not utilized because of both the deterrents I have listed, and the fact that car traffic needs to be slowed down and reduced in our city. That was a cute video and I really like the Bike Train idea. But I have a problem with designating bike lanes given the current condition of many Hamilton roadways. Has anyone here actually rode their bike on the north side of Barton from Centre Mall to downtown lately? Dozens of the storm water catch basins are like craters ready to swallow unwary bikers. You cannot ride safely near the curb anywhere along this stretch. I ride in the middle of the right hand lane to avoid swerving in and out of traffic. I should also mention that many of the storm sewer covers on Cannon as well as Barton have their slots orientated parallel to the curb. This is very uncool especially for bikes with skinny tires and should you catch one just right, you're going over the handlebars. But I have a problem with designating bike lanes given the current condition of many Hamilton roadways. There are certainly cases where no bike lane would be better than a bike lane in this city - the little stretch where King West bends into Westdale for example: the curb lane is so cracked and bumpy that I have to swing out into the proper lane in order to avoid violently jarring my bike, spine and laptop. And I'm sure that leaves motorists thinking "why the hell isn't he using the bike lane? damned cyclists ..."
I've always regarded those as painted-off shoulders and taken the lane anyway. Just because there's a white line doesn't mean it's a bike lane (despite what drivers like to scream at me). I've been biking to work for over 20 years now. There have been a few winters I've ridden right through, while most other wintes there are only a few days that prohibited bicycling for me cuz of snowy road conditions. Once it's cleared the enxt day, biking resumes. I've got saddle bags on my bike that can carry quite a bit, in terms of volume and weight, and they're water proof. Those bags must have cost you an arm and a leg! You could have bought a car for that price I bet - and then you could have used it to get to work on the 3 days each winter that there was too much snow to cycle!